This article originally appeared in Pathways magazine. 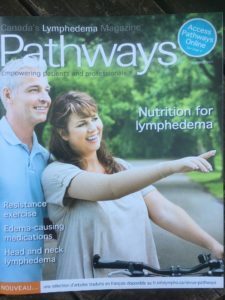 Permission to republish the article as a Cancer Bites blog was granted by the publisher of Pathways magazine, namely The Canadian Lymphedema Framework. Read more about the Canadian Lymphedema Framework and the great work that they do to support people with lymphedema here. Nutrition care for lymphedema appears to be an unexplored area, yet full of potential. After recently undertaking an exhaustive review of the published literature I want to present on two key areas in which nutrition shows potential for helping with lymphedema. A study published in 2007 by researchers in London, UK, tested whether weight loss might be beneficial for lymphedema. A clinical trial was designed with 21 women. Half of the women were assigned to limit their calories between 1000 and 1200 per day for 12 weeks. After twelve weeks, the women in the weight loss portion of the study lost an average of 3.3 kg (7 lbs). While this may not seem like a lot of weight loss, it allowed these women to lose 350 ml of volume in their affected arm (compared to 121 ml inter unaffected arm). Compare this to the non-weight loss group that lost only 11 ml. In a second study published in the same year, by the same U.K. researchers, they compared a low calorie diet versus a low fat diet on lymphedema. This study lasted twice as long; 24 weeks. In this study there were two different diets tested. The first diet restricted calories to 1000-1200 per day, this was called the ‘weight reduction diet’. The second diet restricted fat to 20% of calories. This was considered the ‘low fat’ diet. There was also a control group, who simply continued with their usual diet for the 6 months of the study. After 6 months, there was a reduction in excess arm volume, but it didn’t depend on the type of diet. What was seen however, was a greater reduction in excess arm volume when weight was lost. There were small changes in arm volume in the unaffected arm over the 24-week study compared with changes in the arm with lymphedema, so we know there was more than just weight loss that could explain the decrease in volume. Even though, the women in the control group and the low fat diet group were not supposed to lose weight, several did, and when they did – they lost more arm This made it difficult to see if a low fat diet without weight loss would reduce lymphedema, but it did show that weight lost – no matter the diet to achieve it, resulted in lower lymphedema volume. The lymphatic system is very involved in digestion. This is especially true for the digestion and absorption of fat in the diet. Fat includes vegetable oils, butter, margarine, fat from meat, dairy, eggs and hidden fat in foods. monoglycerides, diglycerides, glycerol and fatty acids. Fatty acids are classified by length. They are either short (less than 6 carbons), medium (6-12 carbons) or long (13-21carbons). Glycerol, short chain fatty acids and medium chain fatty acids are small enough that they can travel through the semi-permeable membrane of the stomach and be absorbed into the blood stream. The other components are too big to do this and continue to travel through the digestive system into the small intestines. Once there, they are bound to protein and form a chylomicron and travel through the lymph system into the thoracic duct and into the blood. We can make at least 4 litres of lymph fluid per day, and a significant percentage of this is formed in the gastrointestinal tract. Lymph flow increases after a meal, especially a fatty one. This information raises the question, if you change the type or amount of fat in the diet will it improve lymphedema? After an exhaustive search, two publications were found that addressed this question. The first publication is a case study. As far as research goes, case studies are considered the lowest on the scale in terms of evidence-based credibility, but with so little research available, it is worth sharing. Patient A was a 30 year old woman who was put on a weight loss, low fat diet plus a specialized oil called medium chain triglyceride (MCT) for 4 months. MCT oil is not naturally occurring. It is made by extracting only the medium chain fatty acids from either coconut or palm kernel oil. Patient B was put on a low fat diet plus MCT oil for 4 months. For the diet they avoided fatty meat, cheese, fish, butter and oils with the exception of 1 tsp of sunflower oil per day. They were allowed to use MCT oil. Patient A lost 22 lbs (11 kg) and reduced the leg with lymphedema by 7 cm. Patient B didn’t lose weight (didn’t need to) and reduced her leg circumference by 3 cm. I should point out that in addition to the diet, they both did physiotherapy. The second study on this topic is a clinical trial. This one was published in 2008 in San Paulo, Brazil. Ten women with upper arm lymphedema following breast cancer surgery plus radiation and chemotherapy were in the study. The control group received physiotherapy three times a week for four weeks and used corn oil in their diet. The study group received the same physiotherapy but used MCT oil in their diet. The study group received the same physiotherapy but used MCT oil in their diet. The researchers compared several variables between the two groups. The most dramatic difference was in arm volume. The women who used the MCT oil lost 200 ml of arm volume, whereas the corn oil group actually gained in volume. Although they provide preliminary data, these four studies give us interesting food for thought. Weight loss has many benefits, and if these studies are corroborated by further research, we may be able to add volume reduction to that list. As for the MCT oil I do not suggest that everyone run out and buy MCT oil and start taking it. Like any change in the diet, there needs to be a thoughtful consideration of each individual’s situation. I suggest working with a registered dietitian to guide you in the process of diet change. I think diet for lymphedema has a lot of unexplored potential. To work with me one-on-one or to join a small group Nutrition for Lymphedema focus group contact me at jean@jeanlamantia.com or 416-561-1196. I am located in Toronto, Ontario, Canada but telephone counselling is available wherever you are. Cancer. 2007 Oct 15;110(8):1868-74. A randomized controlled trial of weight reduction as a treatment for breast cancer-related lymphedema. Shaw C, Mortimer P, Judd PA.
Cancer. 2007 May 15;109(10):1949-56. Randomized controlled trial comparing a low-fat diet with a weight-reduction diet in breast cancer-related lymphedema. Shaw C, Mortimer P, Judd PA.
Angiology. 1994 Aug;45(8):703-7.Dietary treatment of lymphedema by restriction of long-chain triglycerides. Soria P, Cuesta A, Romero H, Martínez FJ, Sastre A.
Rev Bras Fisioter. 2008;12(1):31-6. Influence of physical therapy associated with intake of medium-chain triglycerides for treating upper-limb lymphedema. Oiverira J, César TB. 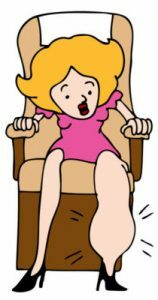 Lymphedema can get worse with air travel. Consult a lymphedema professional before you travel so that you can take appropriate precautions.